A DISABLED man was left in Blackburn town centre after a driver refused to let his carer on his bus – despite her carrying a British Red Cross carers’ card. Nathan Montague, 19, has problems with his hearing, asthma, has been tested for autism and attention deficit and hyperactivity disorder and takes anti-depressants. His girlfriend, 16-year-old Charlotte Hamer, looks after his medicine and has to be with him at all times in case he has a problem. Mr Montague, who lives with Charlotte and her parents in Rothesay Road, Blackburn, carries a NoWcard, which gives him free travel on Transdev buses. But when the pair tried to get on the number seven bus in Blackburn Boulevard to get home, Charlotte, who carries the Red Cross Carers Emergency Card, was denied access by the driver – despite having used the card for free travel on several occasions. The pair had no money with them and were left to walk home in the cold. Mr Montague said if he was left on his own he could have real problems. 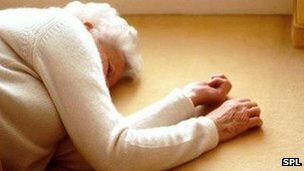 More than one in five of the 500 people aged 75 and older, interviewed by the Women’s Royal Voluntary Service charity, lived in fear of falling.